Kim Yo Jong, the younger sister of Democratic People’s Republic of Korea (DPRK) top leader Kim Jong Un, sat next to Republic of Korea (ROK) President Moon Jae-in at a concert by the Samjiyon Orchestra from Pyongyang on Sunday in Seoul. The Democratic People’s Republic of Korea (DPRK)’s high-level delegation left the Republic of Korea (ROK) to return home on Sunday, Yonhap reports. The DPRK delegation met with ROK President Moon four times during the historic three-day visit. One of the meetings resulted in a personal invitation for Moon to visit Pyongyang, delivered by Kim Yo Jong. Kim Yo Jong, the younger sister of DPRK leader Kim Jong Un, and his special envoy, was in town for many of the cultural events at the beginning of the PyeongChang Winter Olympics. Kim Yo Jong and the DPRK’s nominal head of state Kim Yong Nam were present at the concert performed by the Samjiyon Orchestra from Pyongyang. In response Moon said that he hopes that the right conditions can be created so that the proposed visit can take place. Later in the day, Moon and the DPRK delegation also jointly attended the opening match of the unified women’s ice hockey team comprised of athletes from the North and the South. 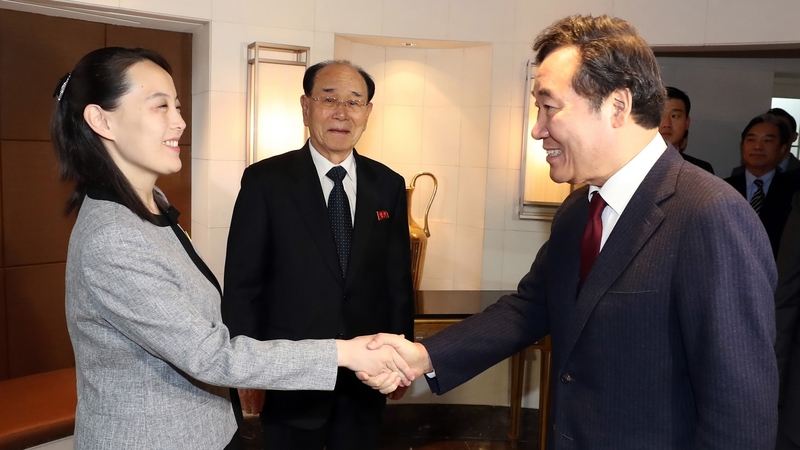 Earlier on Sunday, Kim Yo Jong and Kim Yong Nam had lunch with ROK Prime Minister Lee Nak-yon, an opportunity to discuss the invitation for Moon to visit the DPRK. Lee echoed Moon’s remarks during the lunch and added that inter-Korean talks should continue after the Olympics. The DPRK delegation’s visit to the ROK marks the warming of ties between Seoul and Pyongyang, while the West remains suspicious of Pyongyang’s approach. At Friday’s Olympic opening ceremony, athletes from the two nations wore the same white jackets and marched together under a united Korean flag. Republic of Korea (ROK) President Moon Jae-in had a rare and historic meeting on Saturday with a delegation from the Democratic People’s Republic of Korea (DPRK), including Kim Yo Jong, the younger sister of DPRK leader Kim Jong Un, and the country’s nominal head of state Kim Yong Nam.